Grieving is a highly personal experience and reactions differ from person to person. Feelings of loss are arguably the most unique, confusing feelings with which to cope. Therapist and grief expert Stephanie Jose understands this. She wrote Progressing through Grief as an interactive resource to gently meet you wherever you are today, as you move through your grief and towards healing. 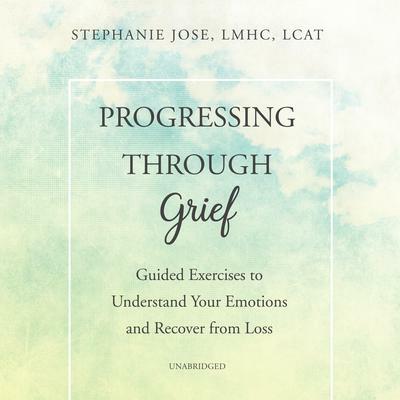 Stephanie has spent countless hours working with grieving clients, and she saw the need for a resource that would address the various feelings of grief that occur at any stage of the process. Twenty years ago, Stephanie Jose became well acquainted with grief when she suddenly lost her friend. She has experienced first-hand many of the same feelings as her patients. 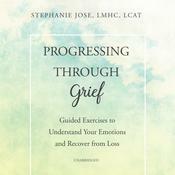 Progressing through Grief provides practical methods for coping with immediate feelings of loss, as well as the difficult emotions that can persist over time. Designed to be a companion as you courageously confront and process your feelings, Progressing through Grief is intended to help you progress through your grief and into healing. Stephanie Jose, LMHC, LCAT, is a New York State–licensed mental health counselor and licensed expressive arts therapist. Since 1999, she has worked in the mental health field, focusing on helping people dealing with trauma, self-injury, loss, and depression.